TKEY is used in most professional DJ apps like Tractor and it is one of few essential parts in DJ Mixing for selecting track. Most common approach is Harmonics Mixing used by major DJs. 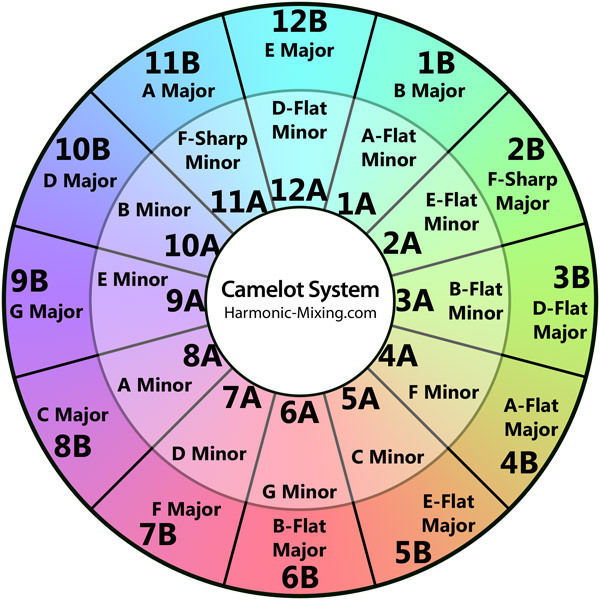 From what I tested most recognizable TKEY format is http://www.harmonic-mixing.com/Images/camelotHarmonicMixing.jpg chart but when you try to find key manually on keyboards http://djprince.no/table2.htm is more useful. a) Some apps like tractor save TKEY in non standard 7 Char length using Camerlot Harmonics Values in format <KEY1>/<KEY2> where each one is 3 char long. http://www.mixshare.com/software.html (Can Use http://www.xuggle.com/) Home Of Rapid Evolution APP. Uploaded small example of end result when BPM and TKEY is used to calculate BPM+TKEY to make playlist. I used http://www.djprince.no/site/DMG.aspx for gathering TKEY Values Similarity along with files I had in My MM library. Assigned to Jiri for inclusion in 5.0 as priority change for MMW 5 database. Looks like we could add it for 5.0, unless we find any significant difficulties with tagging standards. Added harmonics mixing tables and translations of only two standards. They should be String value NON Unicode and I have not seen value more than 7 Chars as explained in description for Serato and Tractor. Ludek please add support for filters and masks for this new field/column (SD.initialKey, named "Initial Key"), so it can be used e.g. in auto playlists, auto organize, etc.